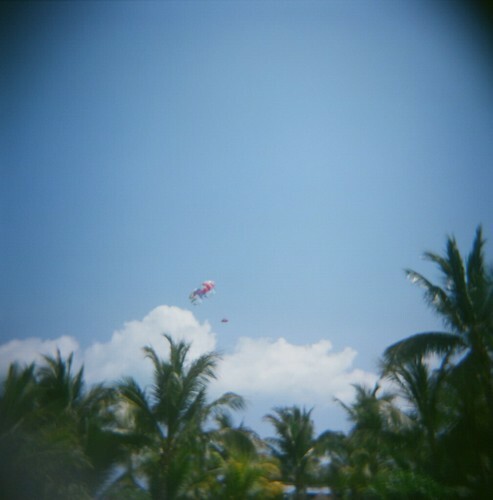 In Mexico, we went parasailing. I was kind of surprised that I did. Not that I was afraid, or that it didn't interest me, or that I'm not the adventurous type. (Although that last one probably is the real reason, but let's just say it's not, because otherwise I'd have to admit that I'm boring. Again.) No, I was just perfectly happy with my feet planted nice and pretty right on the ground, poolside. After all, when you're making it a point to laze about on your honeymoon, any interruption is just that: an interruption. I wasn't feeling it. So we went parasailing, and I'm glad we did. Just like I'm glad I made these oatmeal cookies. I know, I know, parasailing and oatmeal cookies? Kind of a stretch. But hear me out. I'm not a huge fan of oatmeal cookies. I've never been a fan of oatmeal at all -- I'm more of an eggs-and-bacon, chocolate-chip-cookies kind of girl. 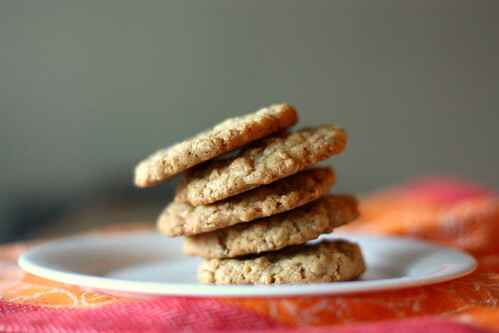 I'll eat oatmeal cookies, and I'll even like them, a little. But not so much to crave them, or request them, or buy them, and certainly not enough to rush home from work and make them myself, even before I cook dinner, like I did one day a couple of weeks ago. There was this blog post, though, and it was from Smitten Kitchen, and, well. I looked at the photos, I read the reviews, and I just decided. "Yes. I want to make these cookies. And then eat them." So I made oatmeal cookies. These aren't really like your typical chewy oatmeal cookies with raisins or walnuts or dried fruits. 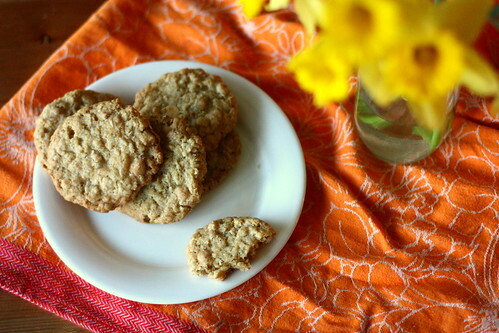 They're more like a cross between a sugar cookie and an oatmeal cookie. They're crisp and sweet, with a slight oat-y bite. There are white chocolate chips involved, though they lend more to the sweetness rather than the texture. They're the kind of cookie that you bite once and decide that "Yes, we've got a keeper." Some decisions are just easy like that. Head over to Smitten Kitchen for the recipe. Deb says to use a good quality white chocolate bar to avoid the "artificial" taste of white chocolate chips, but I'm just not that cool enough to bake with fancy chocolate, at least not yet. So I used Ghirardelli white chocolate chips, which worked out fine. Deb also suggests fleur de sel or Maldon flaky sea salt for sprinkling on top of the cookies, but all I had was Morton kosher salt, which worked out fine, too. So there, now you have no excuses not to make these. I just made White chocolate oatmeal cookies this week! Or maybe I should say cookie... I made one giant one on a pizza pan. YUM! I went parasailing in Mexico too, and up there with the wind in your ears and on your toes, in the silence, save the whistling air as you float around one gains a few moments of clarity watching the specks below, trusting the boat and the operator. I'll never forget it, the lift off moment when my feet left the sand, the the second I touched it again. Every moment was perfect. Like those cookies. "(For the record, it really was my birthday. That's not just something I say when I want to do something.)" Also - love the way you can intertwine parasailing and oatmeal cookies. You're such a writer! 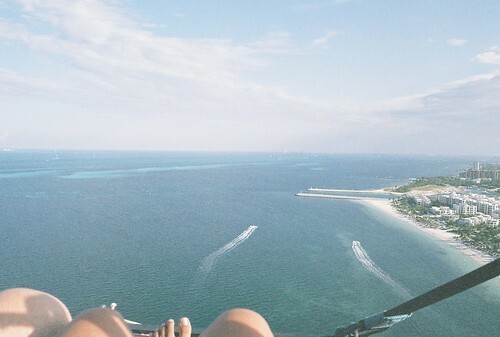 I'd love to go parasailing one day...but I'm a little chicken. I came across your blog recently and love it! And props on the parasailing. I once made it into the harness and then proceeded to chicken out. Therefore you are a champ in my mind. Hey Marli! Giant cookie sounds awesome. Thanks for dropping a line -- love hearing from you! Kate - Oh your parasailing experience sounds so lovely! Our parachute had a seat, not a harness, but now I'm wondering if the harness is better? Linnea - I probably wouldn't have made these if they didn't have white chocolate chips! Thanks for your sweet words. Stephanie - It makes me soooo happy that you're getting a film camera! And I'm with you with raisins in cookies. I usually only like raisins in raisin bread. Maddie - It actually didn't seem so high when we were up there! And hey, staying on the ground isn't so bad, either, esp. when there are cookies. I've decided that there most certainly is a connection between your wedding and honeymoon and baking these delectable cookies: You've used all the neat bake wares you received as wedding presents, and perhaps a birthday mixing bowl or two in the process. ;-) Happy birthday and congratulations on your marriage. 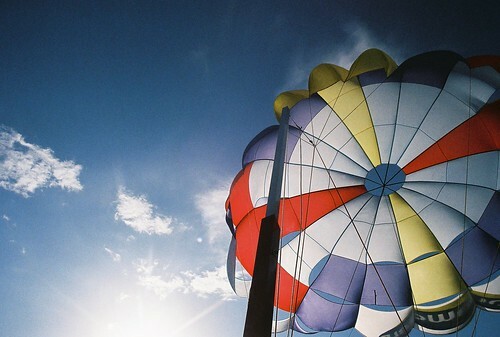 May it always be as exhilarating as flying 20 feet off the ground over a wide open sea. yay for parasailing!!! that is so brave! Molly - You're so right! I've been baking so much more now that I've got all the baking essentials, thanks to the wedding registry. :) Thanks so much for your sweet words. Char - Thank you -- it was fun! parasailing! that is so dang cool. also, these cookies look so good. i LOVE oatmeal cookies, of any variety. You didn't have a belt?! Well the photos look awesome and you clearly made it through so it was worth it. Hannah Queen - Definitely try these cookies! oatmeal and white chocolate what a match made in heaven!